The Scalamandre Baldwin Centerpiece Bowl is named in honor of famed decorator Billy Baldwin, and inspired by one of his favorite wallpapers and fabrics by Scalamandre. Scalamandre Maison's Baldwin bowl presents a chinoiserie-inspired pattern and an elegant centerpiece to transitional tabletops. A hand-painted bamboo design embellishes this white porcelain decor piece, while solid brass ormolu casts adorn the sides with striking allure. 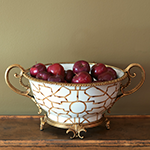 Glorious with a spray of white orchids as a centerpiece, or simply with red apples, the Baldwin centerpiece bowl is a chic, timeless accessory for the ages. Measurements: 10" H x 16" Diameter Width with handles: 21"